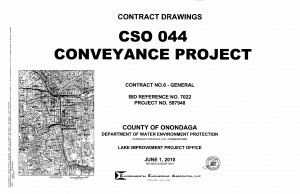 Details: The CSO 044 Conveyances Project provides for the transmission of wet weather flow from CSO 044, which discharges to Onondaga Creek at South Avenue and West Castle Street, to the Midland Regional Treatment Facility (RTF) on the south side of Syracuse. 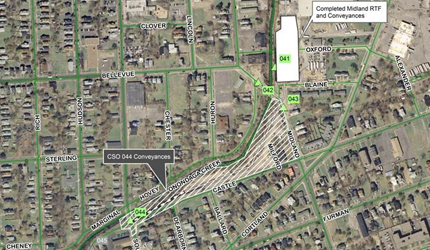 Conveyance of the combined sewer flow to the Midland RTF will be via approximately 500 linear feet of 96-inch diameter pipeline between the terminus of the 144-inch pipeline installed under the Midland Phase Two RTF and Conveyances Project to CSO 044. 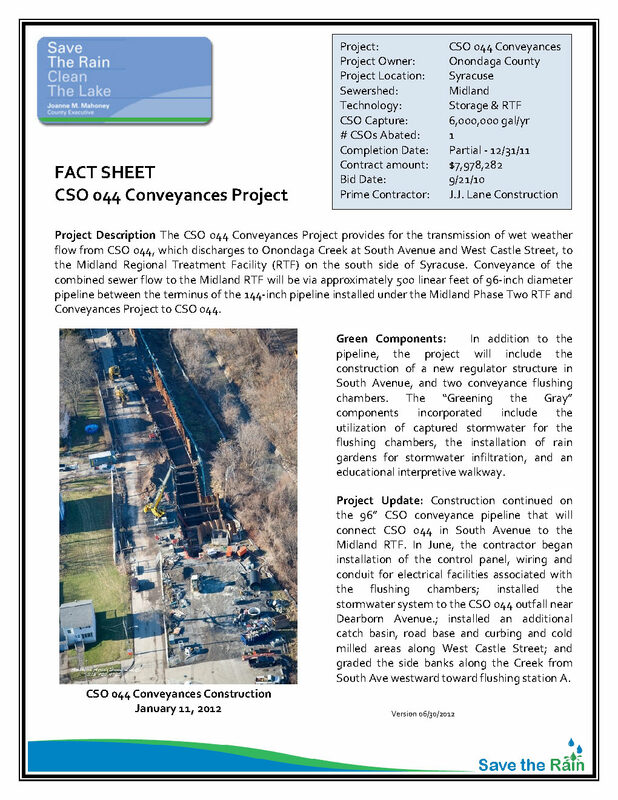 Greening the Gray: In addition to the pipeline the project will include the construction of a new regulator structure in South Avenue, and two conveyance flushing chambers. The “Greening the Gray” components incorporated include the utilization of captured storm water for the flushing chambers, the installation of rain gardens for storm water infiltration, and an educational interpretive walkway. 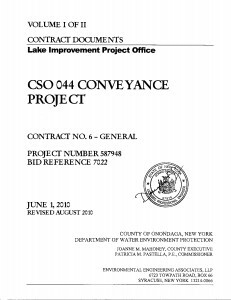 Project Update: On June 5th, 2013 the final walk-through for the “Greening the Gray” green infrastructure components was held and a punch list was created. 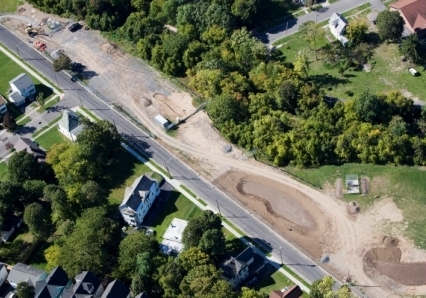 In addition to a new 96-inch pipeline which will transmit combined sewage from CSO 044 in South Avenue during wet weather overflow events through the previously installed 144-inch diameter sewer that connects to the Midland RTF, the project included numerous green infrastructure components (porous concrete walks, bioretention cells, rain gardens) to enhance the green space that currently existing over the new pipelines. The project is in the closeout phase.